If ever there was a reminder of the incisiveness and scorn that Orwell could summon, that is it. 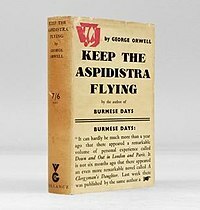 The quote comes from Orwell’s Keep The Aspidistra Flying, which was published in 1936. The novel features Gordon Comstock, who tries to disdain and defy the Money God. Sadly, he loses (or at least his life is cast into misery). But most of us know all about that, right?